Town is still seeking $17 t o $20 million in funding for urgently needed repairs at collapsing bluff. A plan to repair and stabilize the East Chop bluff won approval with conditions Thursday night from the Martha’s Vineyard Commission. The proposal was submitted by the Oak Bluffs conservation commission and CLE Engineering. The next step will be to submit a phasing plan once funding for the project is secured. The town is still seeking $17 to $20 million to pay for the project. The vote came after a short presentation by project engineer Carlos Pena on the current damaged condition of the bluff, exacerbated by recent northeasters. East Chop Drive is currently closed to traffic due to further erosion from recent storms. A condition proposed by the land use committee to limit construction work to outside the summer season was amended to allow work year-round, after several commissioners expressed concern about the urgency of the project and the need to be flexible in case of extraordinary circumstances, such as bad weather. 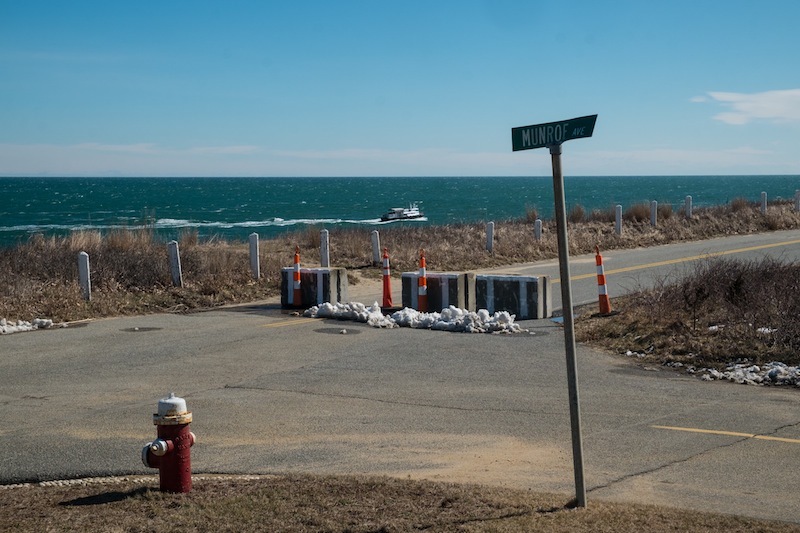 “I think flexibility makes sense since we don’t know what will happen with all the storms and erosion,” said Oak Bluffs conservation agent Liz Durkee. Commissioner Linda Sibley said she worried that repairing the bluff would lead to high foot traffic in the summer months that would be detrimental to East Chop residents. But Mr. Doyle had another view. “I think residents will be more concerned if they can’t get to their houses and if their houses are part of the erosion,” he said. Another condition suggested by commissioner Fred Hancock will restrict use of a north access road until funding for the project is secured. The bluff falls within the coastal district of critical planning concern (DCPC), a special overlay planning district enacted through the commission. In other business Thursday, the commission voted to allow demolition of a West Tisbury building on Old Courthouse Road that had previously served as the town hall and fire station. The town wants to build affordable housing on the lot, subject to approval by voters at a future town meeting. The approval includes conditions requiring the town to use its best efforts after demolition to ensure that salvaged materials are recycled and reused. The town must also advertise prior to demolition and consider offers for moving the building off-site. The building can be razed within six weeks of advertising if there are no acceptable offers. Michael Kim, the governor’s appointed member of the commission, abstained from voting, expressing frustration that the town couldn’t come up with a plan to use the building to fill a community need. Mrs. Sibley agreed it would be a shame to lose the building which is historically significant, and said she would like the commission to find a way to move it off-site. “To convert to affordable housing, they would have to change it so drastically that the historical value would be gone,” she said. “Economically, that’s ridiculous,” Mr. Kim said, speaking of the idea that the MVC move the building. Commission members agreed to submit strongly-worded comments on the Eversource five-year vegetation management plan to spray herbicides around Vineyard power lines. The commission doesn’t have the power to stop the Eversource plan, but executive director Adam Turner said as a regional planning agency, the commission can still have a voice in the matter. Strategies proposed by the commission include removing triclopyr and imazapyr, the two most hazardous chemicals in the herbicide, from the spray and exploring the option of establishing and Islandwide DCPC that would regulate herbicides. The state Department of Agriculture Resources has extended the public comment period for the Eversource management plan to March 30, at the request of state Sen. Julian Cyr. Why don’t we wait another year to get this project started. That way the cliffs will erode all the way up to the porches on the East Chop homes. The burearcracy to start this project is amazing. It’s been how many years since Sandy and now we have major storms hitting weekly. Also, Ms Sibley should resign her position as she clearly does’nt get it. Those terrible summer people, bringing all their money and jobs to the island community. High foot traffic on East Chop is detrimental to the residents? They can't have people walking on the road past their homes? What?